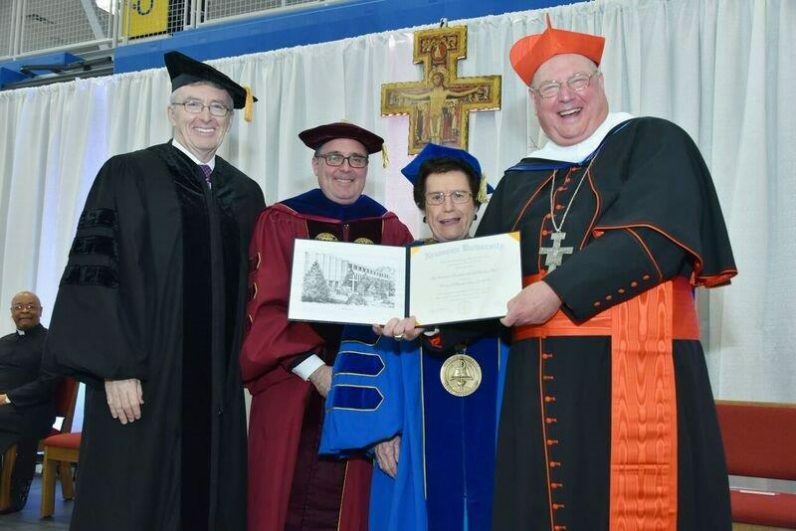 Cardinal Timothy Dolan of New York joyfully receives his honorary degree from James Delaney (left), chairperson of the Neumann University board of trustees; Lawrence DiPaolo (second from left), vice president for academic affairs; and Rosalie Mirenda, university president. A late winter storm couldn’t put a damper on the spirit of Neumann University’s 52nd Charter Day on Wednesday, March 15, which also welcomed the Archbishop of New York, Cardinal Timothy Dolan. Amid the freshly plowed roads and lingering snow and ice left behind by Tuesday’s storm, activities went ahead to mark the granting of an education charter to the school, originally Our Lady of Angels College, by the Commonwealth of Pennsylvania in 1965. Neumann continues to be sponsored by the Sisters of St. Francis of Philadelphia. Service was a theme for the day especially at the academic convocation and 13th annual Dorothy A.P. Leunissen Presidential Lecture by the cardinal that followed the Mass in the Mirenda Center Sport, Spirituality and Character Development on the Delaware County campus. “Whoever wants to become great among you shall be your servant,” read the Gospel passage from the Mass (Mt. 20:26). “We are blessed to be here to commemorate the chartering of an institution whose heart and soul is dedicated to the service of others, our very own Neumann University,” said Lawrence DiPaolo Jr., vice president for academic affairs. Neumann University President Rosalie Mirenda stands with Cardinal Timothy Dolan at the Charter Day festivities March 15. In his lecture titled “St. John Neumann: Yesterday, Today, Tomorrow” Cardinal Dolan spoke on the intertwined nature of Christ and the Church, noting that there can be no separation between the two. “Here is communion realized in the gift of friends and classmates,” he said. 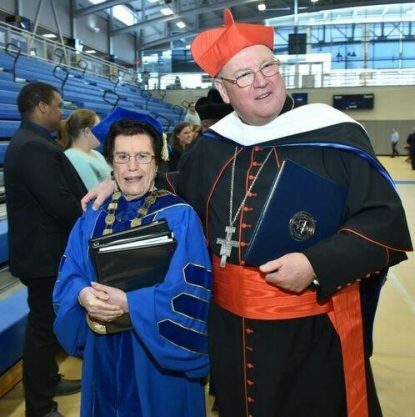 Cardinal Dolan was grateful for the honorary degree he received from the university, furthering a theme of gratitude also present during Charter Day. “I was thankful to be a part of it. It was an honor to be here,” DiPaolo said. regarding the day. The day struck a bittersweet note, however, as it was Neumann President Rosalie Mirenda’s last Charter Day as leader of the university. She will retire as president after 21 years at the close of the current term in June. Appropriately, the sisters closed the ceremonies with the Blessing of St. Francis, composed by Franciscan Sister Bonagratia Hughes, echoing both Mirenda’s legacy and the university’s hopes: “Pace e bene” (Peace and all good).